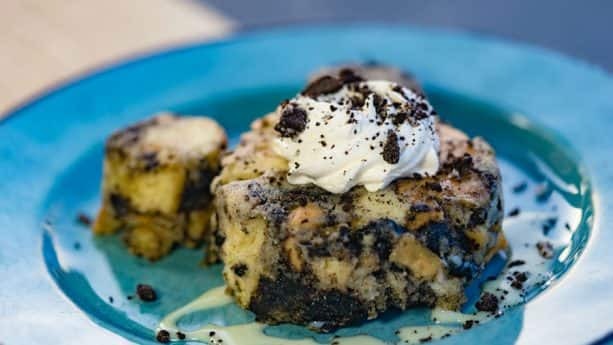 I absolutely LOVE anything cookie’s and cream, so when I heard that our chefs tested a recipe for the Cookies ‘n Cream Bread Pudding at Disney California Adventure Park, I couldn’t resist sharing it! This special dessert is currently being offered at Pacific Wharf Café for Get Your Ears On – A Mickey and Minnie Celebration at Disneyland Resort. It’s the perfect sweet ending to any meal, and I know I’ll be making it tonight!